The FTR 150 feeder is the latest product in a range designed especially for the material handling industry. The FTR 150 is rugged and highly cost effective. 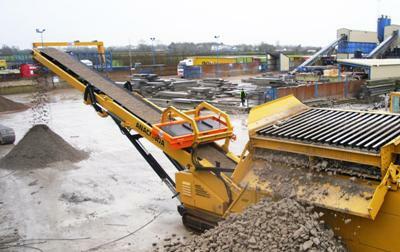 The FTR 150 has been designed for aggregates, sand & gravel, coal and other related industries. The unit has a variable speed belt feeder and a 50 ft (15m) long stockpiling conveyor which is ideal for truck/wagon/barge loading or to act as a surge feeder in an existing or new quarry plant. The FTR 150, like all Anaconda products will be folded and shipped worldwide in a standard 40 ft container.